The 2010 Yosemite Silver Uncirculated Coin will be the third five ounce collector grade coin released by the United States Mint in a new series of coins. 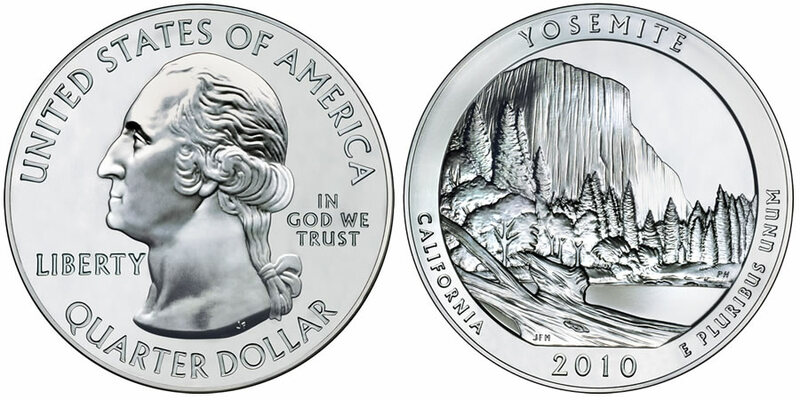 It honors Yosemite National Park of California with a design on its reverse. This new series of strikes is called the America the Beautiful Five Ounce Uncirculated Coins and are struck as the numismatic versions of the Mint's America the Beautiful Silver Bullion Coins™. Both of these series are composed of five ounces of .999 fine silver and feature designs similar to those found on the Mint's America the Beautiful Quarters® Program. Making the five ounce uncirculated coins different from the bullion coins, however, is the inclusion of a mintmark on the uncirculated coins and a collector grade finish versus no mintmark and a bullion finish on the bullion strikes. Yosemite was created as a national park on October 1, 1890 by authorizing legislation signed by Benjamin Harrison. It was actually set aside for future public use decades earlier by President Abraham Lincoln when he signed the Yosemite Grant on June 30, 1864. Despite both of those official acts, the area was not completely taken under federal control until 1906 when President Theodore Roosevelt removed the park from the control of the state of California. When available, the United States Mint will sell the Yosemite Five Ounce Silver Uncirculated Coins directly to the public. This is in contrast to the related silver bullion coins, which are sold through the Mint's network of authorized purchasers. The inscriptions of "UNITED STATES OF AMERICA," "LIBERTY," "IN GOD WE TRUST" and "QUARTER DOLLAR" surround John Flanagan's portrait of George Washington on the obverse of the coin. It was originally designed for use on the 1932 circulating quarter dollar and has been in use on the quarter dollar ever since. Designed by Joseph Menna and sculpted by Phebe Hemphill, the reverse of the coin shows a view of the granite monolith known as El Capitan. Also shown are the inscriptions of "YOSEMITE," "CALIFORNIA," "2010" and "E PLURIBUS UNUM." An edge inscription on the Yosemite Silver Coin shows its weight and fineness with ".999 FINE SILVER 5.0 OUNCE."